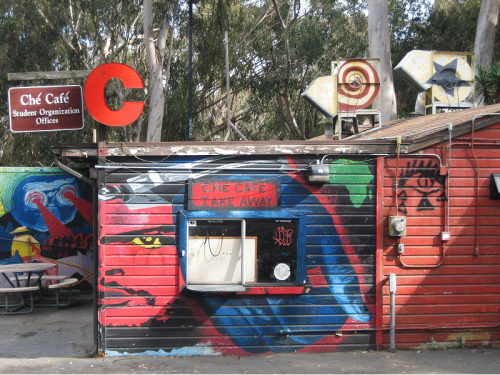 UCSD’s Che Café has been saved. For now, anyway. The renowned cultural icon, which operates as an all-ages music venue, performance space and cafe, won a temporary restraining order allowing the collective that runs the space to keep possession until a full hearing on the merits of their case can be heard. A hearing is scheduled for August 1, 2014. If the Che prevails in the preliminary injunction hearing, it will maintain possession of the space until a final resolution is reached in the breach of contract lawsuit filed by Che’s legal counsel, Andrea Carter, against the University Regents and by extension, the University of California San Diego (UCSD) on July 7, 2014. The Che Café is one of four largely student-operated cooperative nonprofits on campus. It was founded in 1980, after students pushed for the facility to become a student-run space, rather than a faculty club, since student fees were paying for building maintenance. The University officially gave Notice of Termination for the lease due to the failure of the Graduate Student Association (GSA), one of two representative student government bodies charged with certifying that the all the campus cooperatives are financially sound and in the best interests of students, to certify the Che. These determinations are to be used for extending the lease and as measures for determining student support for the venue’s continued functioning. However only the GSA Board passed a resolution not to endorse the Che’s continued operation. The Associated Students (AS), the representative undergraduate student governance body did not pronounce on the matter. The GSA decision was arrived at after considerable involvement and influence from University administrators and legal counsel, who helped draft the resolution. In public statements, UCSD administrators have alleged that the decision to terminate and close the Facility involves matters of health and safety, citing a 2012 Fire Marshal recommendation that upgrades be made to the building. These include an overhead fire sprinkler and fire alarm system. If these upgrades were actually vital, they would have been deemed mandatory rather than recommended, and the Fire Marshal would have ordered the venue closed. Instead, the Fire Marshal signed off on the cafe for the year in a follow up inspection of April 17, 2014. Further, the building has been in use by the Che Café and other university affiliates before it for nearly fifty years without any safety incident or any expression of safety concerns by UCSD administrators. As well, the Che Café has insurance and a full indemnification agreement with the University. The university waited to give its termination notice until the end of the Spring term, as students were leaving campus for the summer. Despite UCSD’s underhanded tactics, students continue to campaign on behalf of the Che Café. To date, it has amassed huge support from its attendees and musicians. This is evidenced by the outpouring of public comment and letters of support addressed to the University, not to mention the over 11,500 signatures on an online petition. The online comments posted by petition signers show a broad base of students, alumni, campus staff and faculty and the surrounding community in strong support of the Che. The Che Cafe is one of the few affordable entertainment and live music venues not to serve alcohol. It promotes a safe, respectful space that all people can enjoy and often offers local and independent or student-programming. All this is extremely rare in San Diego and increasingly everywhere in the U.S.
Arguably, the real reason for the lease termination is economic. And this is why non-students and the broader community should care and join this push to preserve the venue, even if you have never attended or heard of it before. The University administration has shifted to decisions rooted in valuing revenue-generation and profit-seeking above all else. The Che Facility does not bring in windfall profits for the University. It stands in contrast to a Starbuck’s licensed cafe, or a parking lot where each space brings in hundreds of dollars, or even to a new science building that can house researchers securing grant dollars from which the University can take a sizeable cut. The social spaces the University seems to prefer are privately operated, profit-driven and not dedicated to providing practical educational opportunities, self development and creative expression and growth that more traditional spaces like the Che Cafe affords. Who will watch the watchers? When these transgressions and power plays occur, the University and Regents are making it increasingly difficult to exercise free speech and protest on campus if you are not a student or staff through its policies, most recently, PPM 510.1 Affiliate Free Speech Policy. Do not wait until all our rights and spaces are stripped from us. Stand up and defend this space with us. A loss here is not just a loss of the Café and its attendees, but a diminishment of all of us who enjoy access to independent creative expression, entertainment, healthy food and authentic culture and community. This is a lightly edited release from the Che Cafe Coillective.